The second season of the American television medical drama Grey's Anatomy commenced airing on the American Broadcasting Company on September 25, 2005, and concluded on May 15, 2006. The season was produced by Touchstone Television, in association with Shondaland production company and The Mark Gordon Company, the showrunner being Shonda Rhimes. Actors Ellen Pompeo, Sandra Oh, Katherine Heigl, Justin Chambers, and T.R. Knight reprised their roles as surgical interns Meredith Grey, Cristina Yang, Izzie Stevens, Alex Karev, and George O'Malley, respectively. Previous main cast members Chandra Wilson, James Pickens, Jr., Isaiah Washington, and Patrick Dempsey also returned, while Kate Walsh, who began the season in a recurring capacity, was promoted to series regular status, after appearing in seven episodes as a guest star. The season continued to focus on the surgical residency of five young interns as they try to balance to the challenges of their competitive careers, with the difficulties that determine their personal lives. It was set in the fictional Seattle Grace Hospital, located in the city of Seattle, Washington. Whereas the first season put the emphasis mainly on the unexpected impact the surgical field has on the main characters, the second one provides a detailed perspective on the personal background of each character, focusing on the consequences that their decisions have on their careers. 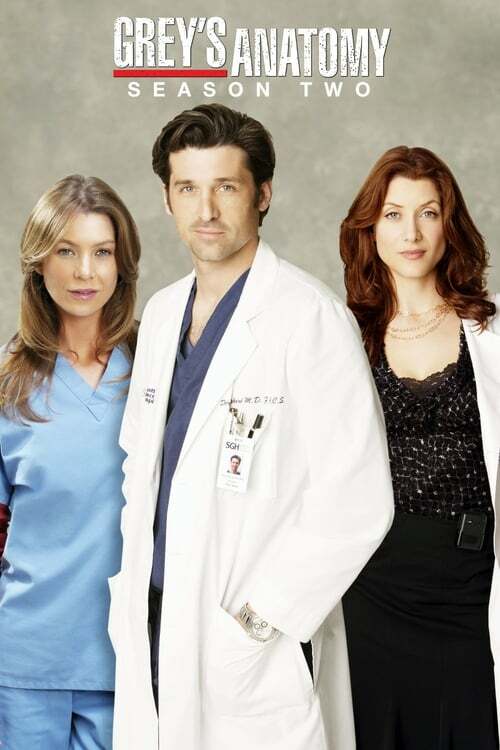 Throughout the season, new story lines were introduced, including the love triangle between Meredith Grey, Derek Shepherd, and Addison Montgomery, the main arc of the season. Also heavily developed was the story line involving Izzie Stevens' relationship with patient Denny Duquette, which resulted in critical acclaim and positive fan response.